dotConnect for MySQL implements SimpleMembership functionality as custom MySqlExtendedMembershipProvider and MySqlExtendedRoleProvider classes. This tutorial describes how to use the new ASP.NET MVC membership provider functionality in ASP.NET MVC 4 application (using the Internet Application template). 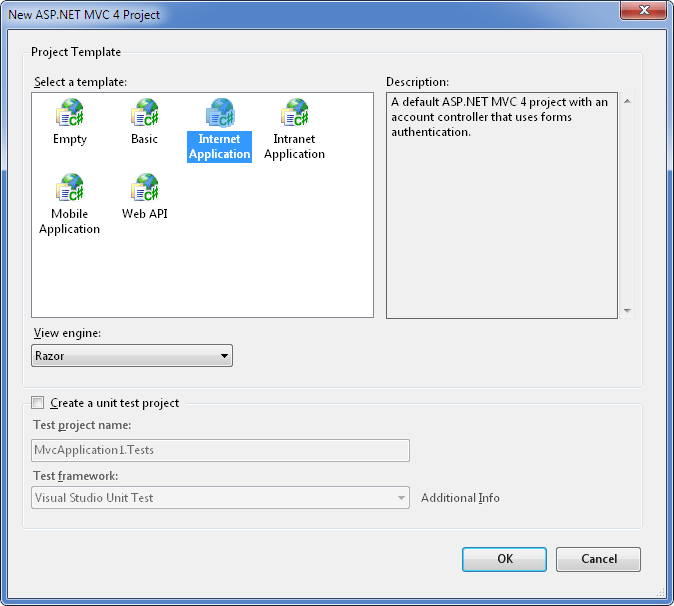 To complete this tutorial you need ASP.NET MVC 4 installed. It is preinstalled with Visual Studio 2012 and later. For Visual Studio 2010 you can download it from here. Create an ASP.NET MVC 4 Web Application in Visual Studio. To do it, select New -> Project from the File menu, click Web under Installed Templates, and select ASP.NET MVC 4 Web Application in the list of available templates. 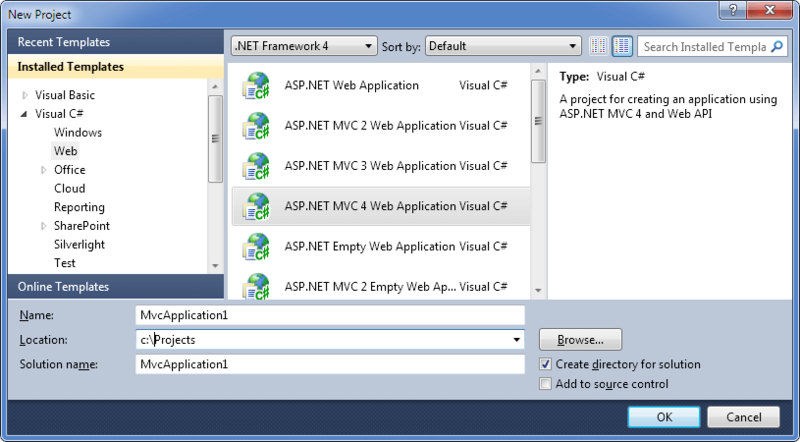 Then select the Internet Application template in the opened New ASP.NET MVC4 Project dialog box. Add necessary references to our assemblies to the project. You need to add references to the Devart.Data, Devart.Data.MySql, Devart.Data.MySql.Web assemblies. Note that you should add the Devart.Data.MySql.Web assembly by selecting it as a file (not from the extension list) from the NET4 subdirectory of the dotConnect for MySQL installation directory (by default, from Program Files\Devart\dotConnect\MySQL\NET4), not the one from the Extensions list. The Devart.Data.MySql.Web assembly that is in Extensions list is for .NET Framework 2.0, and we need the one for .NET Framework 4. The required assembly has the revision number 4 in its version. Note: Replace 8.1.26.4 in the code with your actual version. In the InitializeSimpleMembershipAttribute.cs or InitializeSimpleMembershipAttribute.vb file (that is located in the Filters project folder), replace the namespace "WebMatrix.WebData" with the "Devart.Common.Web". Now you can run the application and check whether it works by registering a user. As you can see, the user is registered and logged in. By default, the application automatically verifies if the tables exist by the specified connection string. The userprofile table is automatically created by Entity Framework runtime if it is not already present in the database. Other tables are created by the WebSecurity.InitializeDatabaseConnection method, defined in the Devart.Common.Web namespace. If these tables are already created, no actions are performed. However you can create these tables manually. Execute the DDL script %Install_Directory%\Devart\dotConnect\MySQL\NET4\InstallExtendedWebTables.sql (for example C:\Program Files\Devart\dotConnect\MySQL\NET4\InstallExtendedWebTables.sql) against the database server to create the database tables to store the user and role information. 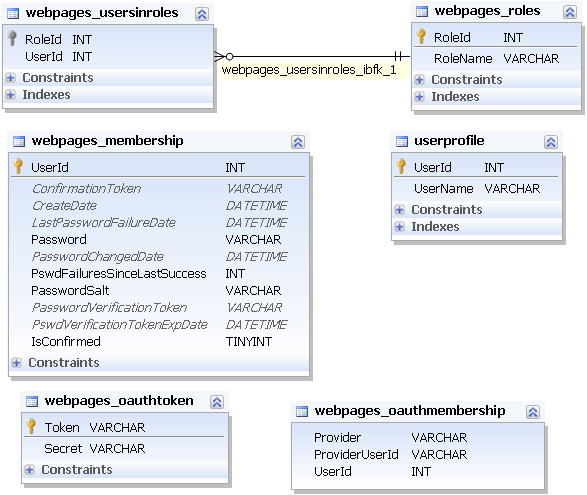 description="dotConnect for MySQL extended membership provider" connectionStringName="DefaultConnection"
description="dotConnect for MySQL extended role provider" connectionStringName="DefaultConnection"